"...a set of products that decidedly deserve that title." 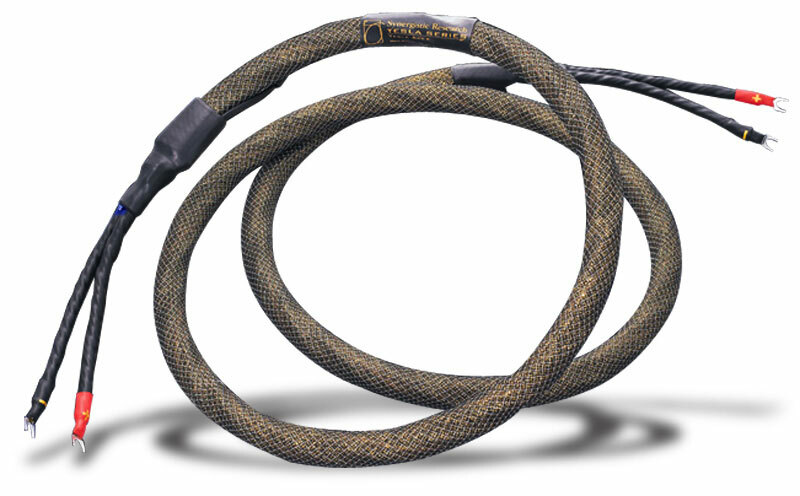 My review of the Synergistic Research Tesla Apex speaker cables and interconnects appeared on SoundStage! in April of this year. As stated in that review, I took a real shine to the Teslas, remarking on the ear-opening level of performance they offered. During my time with them, the Apexes displayed pinpoint imaging and an intoxicating three-dimensional soundstage on which the locations of the performers disassociated from my speakers to plant themselves well beyond the walls of my listening room. On top of these extraordinary abilities, the Apexes delivered one of the quietest backgrounds I had heard, with breathtaking dynamic range, liquidity, and transparency. They also demonstrated steroid-like transient speed, decoded extremely sophisticated spatial and harmonic cues, and, not least, delivered sheer blissful musicality. The Apexes did all of this at a collective price of $12,700: Tesla Apex interconnects, $3600 USD/meter pair; Precision Reference interconnects, $2600/meter pair; and Tesla Apex speaker cables, $6500/8 pair. While such a sum is within the reach of only the best-heeled audiophiles, it becomes more reasonable when you consider that the Apexes play on the same field as some of audios most revered cables, a number of which will set you back at least several times as much. A few weeks after submitting the Apex review to my editor, I received an e-mail from him asking why, in light of the foregoing, I hadnt given them a Reviewers Choice Award. To make a long story short, a lack of communication accounted for the omission. Who was to blame? Well, after considering that the award is called Reviewers Choice, not Editors Choice, I rightfully accepted the responsibility. Not a problem, my editor told me: Just write a brief follow-up and announce the award there. This made me feel better, knowing that I hadnt shortchanged a deserving manufacturer. But where to begin? My original review had been, I thought, pretty thorough. Nonetheless, there had to be more that I could say about the Apexes. Perhaps the best way to begin was to simply grab some discs and give them another listen. Like many audiophiles, I have an enormous collection of LPs, CDs, SACDs, and DVD-Audio discs. However, when I have guests over and want to show off my system, I inevitably reach for one of Winston Mas high-resolution audiophile recordings. In this instance, I pulled out Jun Fukamachis At Steinway (Take 2) (CD, Lim LIMDX038), a classical solo-piano recording that Id referred to in passing in my original review. When I again listened to this disc, I realized that Id never demonstrated my system with a recording of solo acoustic piano. This was because, before installing the Apexes, solo piano had never really sounded that good in the system -- it never really moved me, as I knew it could from hearing live performances. This was a weakness that I had perhaps subconsciously ignored so that I could focus on the things that did sound good. The conventional wisdom is that the piano is one of the most difficult instruments to reproduce. While rich-sounding systems can mask much of the spaciousness and clarity of a pianos notes, lean-sounding systems can sound tinny and hollow. As a result, they dont convey the density necessary to create realistic dynamic impact or fluidity. Also, systems incapable of revealing microscopic shifts in tonality cant fully reproduce the pianos subtleties. This is because the instrument is capable of covering a large number of octaves that together create an almost infinite number of tonal shadings. Four microphones were used to record At Steinway (Take 2), each placed inside Fukamachis grand piano. Two were placed only centimeters above the strings and aimed at the hammers. The other two were located at the edge of the reflection board. This microphone placement is unusual since, in order to obtain a feeling of grandeur, classical piano works are typically recorded with microphones placed at the front of the stage of a large concert hall. This is unlike jazz recordings, where the microphones are often placed closer to the musicians in order to obtain a more intimate listening perspective. As a result of the unusual microphone arrangement used for At Steinway, the echoes and other effects of the hall are noticeably absent from the recording. This allows the listener to feel that he is next to or even inside the piano, rather than sitting in an orchestra seat. Listening to Fukamachi through the Apex cables wrought a revelation. The attack of the notes, their sustain, and their decay were all impeccable. The notes were full and weighty yet superbly controlled, while displaying air and realistic textures that seemed free of glare and edge. When called for, notes sparkled with a clean shimmer at the upper end of the pianos range, and revealed every percussive intonation down below. Moreover, the Apexes faithfully conveyed the intent of the engineers who recorded At Steinway (Take 2) by delivering a listening perspective that clearly emanated from the heart of the pianos interior. Fully revealed to me for the first time were the reverberating echoes within the instruments case. As just another example, on track 1, Chopins Nocturne in E-flat Major (famously used in the soundtrack of the film Love Story), the Apexes revealed the echoes of the pedals more clearly and vividly than I had ever heard before on this disc. Were the Apex cables solely responsible for my systems astonishing ability to reproduce the sound of the piano? Of course not. But when I removed the cables and replaced them with my reference cables, much of that ability vanished. Obviously, the Apex cables wont create magic in a subpar environment. This was demonstrated when I turned to one of my favorite albums, Rick Wakemans The Six Wives of Henry VIII (CD, Fontana/A&M 213229). Despite my affinity for this work, it was recorded in the early 1970s and, like many recordings of that era, its sound leaves something to be desired. Here, the Apex cables revealed some very noticeable hard edges on the upper notes of Wakemans grand piano, demonstrating that not even the Apexes could make a silk purse of this sonic sows ear. 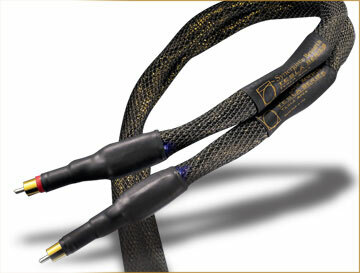 Compromised recordings and equipment aside, the Apex cables, when fed premium source material, will unquestionably bestow on high-performance systems an astounding ability to reach their full potential. Indeed, throughout my review, the Apexes not only nailed the formidable task of accurately reproducing the acoustic piano -- and pretty much every other instrument they encountered -- they made it sound easy. In fact, I wouldnt be at all surprised if you had to spend two to three times the Apexes cost to approach the level of performance they offer. Even then, Id be very interested in the results of a head-to-head comparison. All of this not only makes the Tesla Apex a Reviewers Choice, it makes me feel a whole lot better, knowing I havent shortchanged a manufacturer who has developed a set of products that decidedly deserve that title. Prices: Tesla Apex interconnects, $3600 USD/meter pair; Precision Reference interconnects, $2600/meter pair; Tesla Apex speaker cables, $6500/8 pair.